Qigong is one of the oldest continuously practiced healing systems in the world and is very effective at restoring health. This tradition is based on the cyclical flow of vital energy. The Chinese call this energy Qi, and map its flow through our bodies along pathways called meridians. When our Qi is full and flowing, we experience health. If Qi is congested or out-of-balance, then illness and pain can occur. Qigong is a unique system of energy cultivation incorporating matter and spiritual characteristics to achieve an innate balance of energy. Dynamic qigong exercises strengthen the muscles, bones, and joints; and enhance our internal physiological functions. Static qigong exercises calms the mind & enhances the functionality of nervous system. To register for each course online, click on the price. To register over the phone, please call 352.335.2332. Description: A brief introduction to the practice and history of Pangu Shengong. These free introductions will include refreshments. You may register for other courses during or after the introduction. Register by email here or register by phone 352.335.2332. Description: Participants learn a Qigong form that cultivates Qi to develop a strong energetic & physical body, healing the body from illness and injury to facilitate and maintain optimal health. Participants receive energy to assist them in healing from illnesses and/or injuries; & to elevate the heart & soul to allow for more effective energy cultivation when practicing this Qigong. The energy in retaking this course is equivalent to the energy received during a 1:1 healing session with Master Ou. Description: Participants learn a Qigong form that cultivates energy for the different structures and functions of the brain and central nervous system to develop stronger sensory and cognitive functioning; including improved memory, creativity, and is also good for improving spinal cord conditions. Enhances spiritual development. Participants receive energy to facilitate increased cognitive and sensory functioning of the brain. Energy is equivalent to energy received during a 1:1 healing session with Master Ou. Description: Master Ou sends energy focused on the different structures in brain to facilitate the development of intuitive abilities, participants receive a profound deep healing physically and spiritually, and Master Ou shares information he has received during his personal development. New information is shared with each class. Description: This course was designed as a reward for those who have been diligently practicing both the Foundational Qi Cultivation Moving Form & Cognitive & Sensory Development Non-Moving Form for about 6 months. Practice is necessary for about 6 months to allow the body to absorb Qi at this accelerated rate. A Qigong form is taught that will cultivate Qi at a rate 3x faster than both the Foundational Qi Cultivation Moving Form & Cognitive & Sensory Development Non-Moving Form. Also, during retakes, energy is sent to participants to assist in elevating the heart & soul, facilitating optimal health and healing injuries and illness. Description: Advanced Topics for PGSG Instructors, similar to topics covered in his Path-of-Life lecture. However, topics will be more advanced, similar to annual PGSG retreat, and the intended audience is PGSG instructors (both moving and non-moving form instructors). Description: Healing skills are taught to those interested in helping others recover from a wide range of health conditions and/or injuries; using both in-person and distance healing skills. Energy is sent to participants to facilitate their development of diagnostic and treatment abilities. This course assists both beg. & adv. practitioners improve their healing abilities; retakes are strongly encouraged. Description: Master Ou will share with individuals the unique journey he has experienced over the past several decades which has led him to developing the qi gong that we know as Pangu Shengong. Master Ou shares how the benefits of PGSG practice are realized much more expeditiously when one understands and is able to focus on the quality of the practice as well as the quantity. To help individuals understand and implement good quality practice and therefore maximize the potential benefits of PGSG he will share some of the tempering processing and spiritual discoveries that he experienced as he worked through varies life challenges. He will then share how these experiences led to his understanding of the energetic, physical and spiritual world we live in and consequently the abilities he now shares with this PGSG students with the hope that they too will develop this same understanding and energetic awareness and abilities. Description: This class will give you a brief overview of the history and benefits of Pangu Yoga, a system of Qi Gong designed to heal the body on all levels. Anisha co- created this form with Master Ou’s deep wisdom and guidance. This style of yoga includes a mantra or maxim, visualization, and a special breathing, connecting you deeply to the powerful Love and Healing energy of Pangu throughout the practice. This style opens with a gentle flow of postures, pranayama, and ends with a deeply relaxing savasana, creating a perfect balance of Yin and Yang energy. What gives it such special and unique qualities is that you are able to receive the benefits of both Pangu’s healing energy and those of Yoga which already exist, allowing the practitioner to absorb more Love and Energy from the universe. This class is sure to refill your well and rejuvenate the spirit. Taught by Tai Chi Master Vincent Chu (Boston, MA); son of Tai Chi Grand Master Gin Soon Chu. Vincent began studying Tai Chi at a very early age from his father. Vincent’s father, Gin Soon Chu was a student of the famous Grand Master Yang Sau Chung, the world leader of the Yang school. Grand Master Yang taught thousands, who have in turn promulgated the art throughout the world. Gin Soon Chu was accepted as a disciple in 1977 and made responsible by Grand Master Yang for the sustenance and propagation of the Yang family tradition throughout North America. For the last several years, Vincent has been working with Master Ou to create Pangu Tai Chi, otherwise called by Vincent as “Returning Tai Chi Chuan Form”. In addition to the Pangu Tai Chi Form’s function of working on martial-arts fundamentals such as agility, balance, coordination, and opening the body’s joints by stretching the ligaments, tendons, and muscle groups – Pangu Tai Chi has two unique features. First, Pangu Tai Chi harnesses the qi of the universe in order for it to improve the body’s physiological condition, including the immune system; and, second, an emphasis on exercising the lower body – while not neglecting the upper torso – to improve blood circulation, thus making it easier for the blood to return to the heart. Pangu Tai Chi exercises both sides of the body equally, and it can be performed in a very limited space. The form is divided into three parts, each about 7-8 minutes in length – beginner, intermediate, and advanced levels. 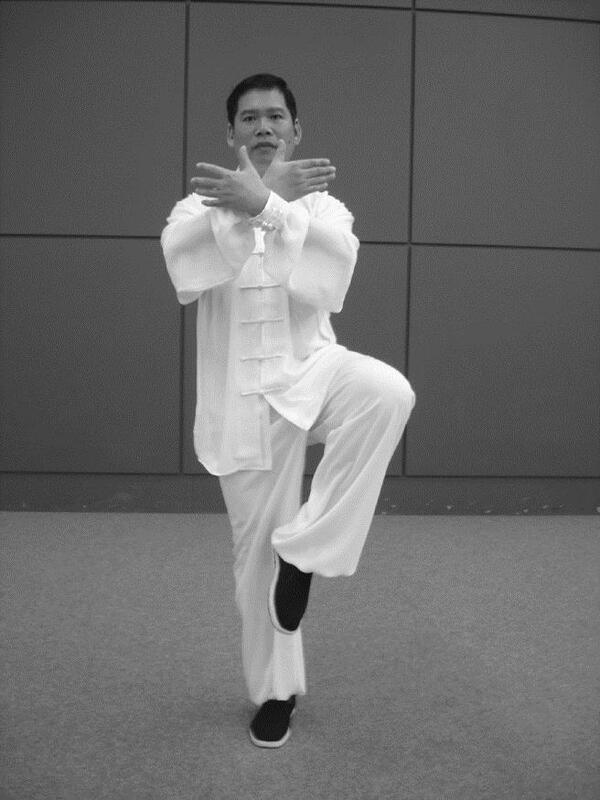 The beginner level of the Pangu Tai Chi Form, will be taught over two days by Vincent. Description: This event is divided into four sections. Master Ou will start with a 10-15 min lecture about Qi Gong, and in particular the healing benefits of PGSG. Master Ou will then send energy to all participants in a classroom setting for 15 minutes. Individuals will then have opportunity to meet with Master Ou 1:1 for 5 min, to ask pertinent questions. As individuals are meeting 1:1 with Master Ou, other participants will be doing PGSG moving forms in a group, as they wait for their turn to speak with Master Ou. Common question: What is the difference between a 1:1 healing and the group healing session? The healing result is the same. Therefore, its personal preference. Some choose to attend both. 15-minute healing sessions are available with Master Ou for individuals who would like to receive Qi to either optimize their health and/or receive assistance with a particular health challenge. There will also be an English translator present for non-Cantonese/Mandarin speakers. Healing sessions are $70. You may register online and then contact us to schedule your session, or contact us directly to register by phone 352.335.2332 or by email at andi.houston@acupuncturist.edu. All healing sessions are first-come, first-served and appointment times are limited. If an individual has previously taken a PGSG course from either Master Ou or one of his certified instructors, then they are eligible to retake that particular PGSG course at a discounted price. To qualify for the discounted price, on the course registration page, please enter the following information in the comment field (Name of Previous Instructor, Course Location, and Year the Course was Taken).